ETUDE HOUSE 0.2 Therapy Air Mask Lemon brightens and moisturises dull looking skin to restore a youthful glow. 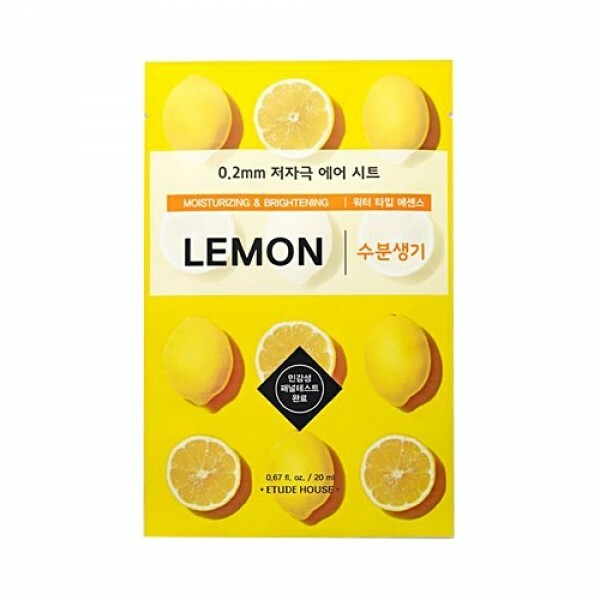 This thin sheet mask is soaked in a moist water type essence containing Lemon Extract. It will replenish your skin with Vitamin C and Vitamin B3, leaving it looking bright and radiant. Etude House Therapy Air Mask Lemon is a refreshing mask that hydrates and revives tired looking skin. Lemon Extract 2,500ppm – rich in Vitamin C and antioxidants to help the skin neutralise free radicals and fight against premature wrinkles and ageing. This ingredient is also rich in Vitamin B3 which cleanses and brightens the skin. See more ETUDE HOUSE skincare here. Water, Glycereth-26, Dipropylene Glycol, Propanediol, Niacinamide, Alcohol, Hydroxyethyl Urea, Butylene Glycol, Glycerin, 1,2-Hexanediol, Citrus Limon (Lemon) Fruit Extract (2500ppm), Sodium Carbomer, Allantoin, Hydroxyethylcellulose, Glycyrrhiza Glabra (Licorice) Root Extract, Coptis Japonica Root Extract, Zingiber Officinale (Ginger) Root Extract, Camellia Sinensis Leaf Extract, Dehydroacetic Acid, Sodium Hyaluronate, Disodium EDTA, Dipotassium Glycyrrhizate, Polyglyceryl-10 Laurate, Polyglyceryl-10 Myristate, Caprylic/Capric Triglyceride, Boswellia Serrata Gum, Beta-Glucan, Hydrogenated Lecithin, Lavandula Angustifolia (Lavender) Oil, Eucalyptus Globulus Leaf Oil, Citrus Nobilis (Mandarin Orange) Oil, Pinus Palustris Oil, Phytosteryl/Octyldodecyl Lauroyl Glutamate, Ceramide NP. Etude means “beautiful study of Chopin” in French. Etude House was the first Makeup brand in Korea and has since expanded into skincare. The Etude House brand philosophy is all about enjoying makeup / skincare and having fun.